Do you like to sit on your front porch, watching people walk by? Having a chance to chat with your neighbors? Or do you prefer a private deck in the back of the house. I am a front-porch kind of person, and the front porch of my antique house needed a lot of attention before it was ready to be my favorite seat in the house. Back to my renovations (link to https://4buyersre.com/dianne-takes-o…on-the-outside): My house looked so much better after we removed the stucco from the exterior of the house. It had shape, it had architectural details. Then, we realized how bad the front porch looked. The original columns and supports had been removed at a previous time, probably when the stucco was put on the house. The columns had been replaced with plywood boxes used as columns. We had the original blueprints of the house, which were passed down from one owner to the next. The blueprints showed us exactly how the front porch looked when the house was built. The original support columns were round, tapered floor to ceiling. There had been another railing on the 2nd floor. Going to a company that sold “architectural parts” taken from older homes that were collected before or after the building was torn down torn down. They had everything from woodwork, to windows, to stained glass, to hundreds of radiators, doors, and doorknobs; including a giant mahogany bar that had been taken out of a downtown Boston restaurant in its entirety, The place I just described is no longer there, there is a place very similar, in the South End. http://www.restorationresources.com Or http://www.hewnandhammered.com. Even though you can now buy copies of historic millwork at Home Depot or Lowes, going to a place like this is amazing, and the idea of reusing architectural materials in a new way makes me feel good. The little cracks and defects make it look like it belongs to an old house. not something that was added later, so looks too slick. Also, older wood is better. New wood is often green, and rots very quickly. 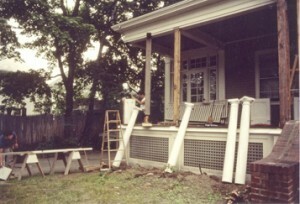 We were unable to find columns that were exactly the right length for our porch but we bought shorter columns and our contractor put them on bases, in a style also appropriate to the house. 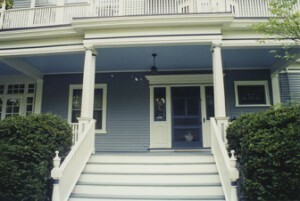 A few years later I continued the restoration by reproducing the railing at the top of the porch, and removing the brick stairs, and wrought iron railings that were part of an earlier renovation, and replacing them with wooden stairs. Again, back to the blueprints. From a part of a drawing that was 1”high, the contractor enlarged the drawing and had posts milled to match the original. These posts were used on the top rail, and at the base of the stairs. Due to some of the renovations that had been done to the house in the 20’s the exact rail could not be replicated, but it was as close as we could get it. After we sold the house the new owners removed this top railing. I always wondered why.